First Credit Union staff (and family!) setting up for the garage sale on Saturday, September 12. We admit it – over the years First Credit Union’s storage locker has collected far more than just dust. This is where displaced desks, worn-out chairs and old shelving units come to retire; every year more Christmas decorations accumulate in the corner and a summer’s worth of event supplies are added to the last. Walking through the maze of credit union relics brings back a lot of memories – but lately the florescent-lit room became so jam-packed that it was almost impossible to pick a path to the back of the room. 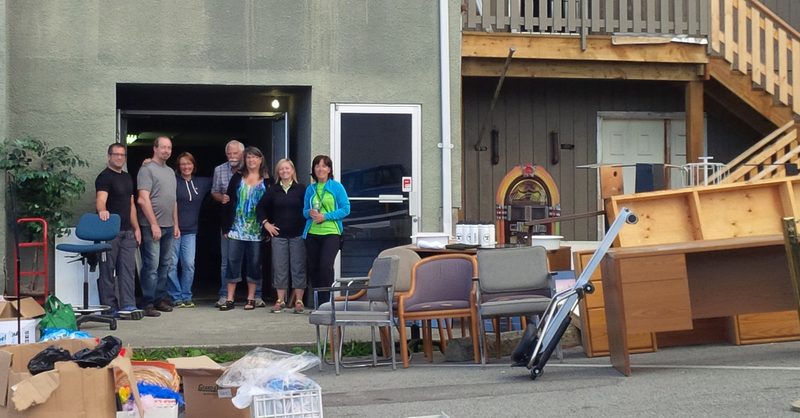 In an ambitious effort to clear out our overflowing storage facility we hosted a garage sale this past Saturday; $565 was raised and all proceeds went to the First Credit Union Community Fund under the umbrella of the Powell River Community Foundation. A community foundation is a collection of charitable gifts donated by local citizens. These gifts are pooled and invested and the investment income is distributed as grants to local charitable organizations. The capital is never touched and continues to grow with each new gift, generating income to meet a wide range of community interests and needs for years to come. < Previous Don’t miss out on free contributions to your child’s education savings.